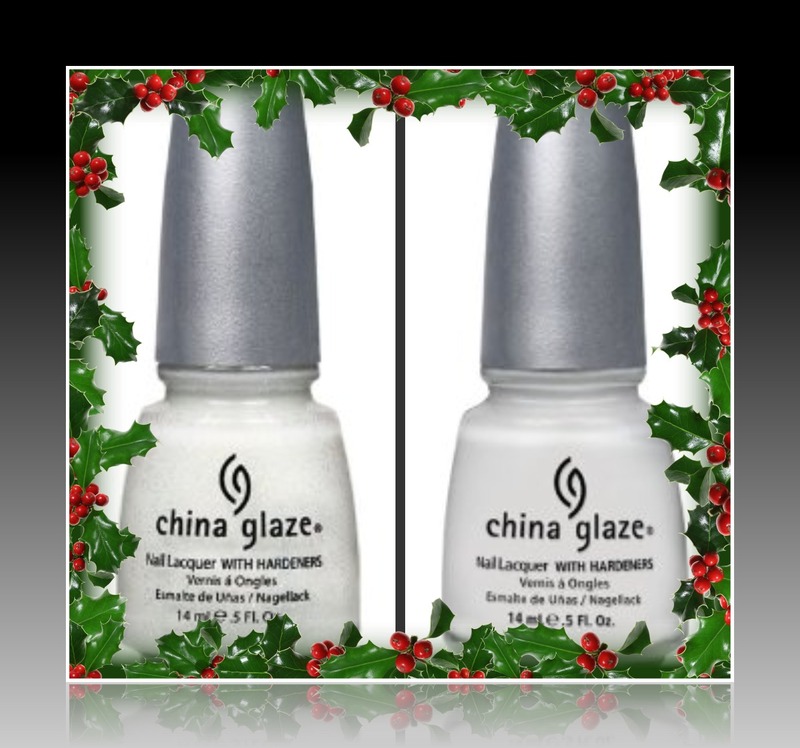 The China Glaze 'Tis the Season Holiday 2010 Collection contains 2 white shades, Snow and Frosty. Aptly named for the season, don't you think? As I've been doing with all of the shades from this collection, I'll be giving away new bottles of each polish as they're posted. If you'd like to enter to win both of these shades, just leave your eMail in the comments below. Below: Snow, a white creme, covered quite well using 2 coats. I'm always a little nervous with white creme shades because they're often thick and/or streaky, but Snow performed nicely for me. This is a clean white shade without being blindingly white. Below: Frosty is shown using one coat over Snow. This is a somewhat sheer pearly white shade with tiny white and silver foil glitter. I used it alone and I was satisfied with 3 coats, although I prefer it over a similar shade. Used alone, more of the silver glitter is evident. The glitter in this sparkles like glistening snow and I noticed indoors under artificial lighting (not shown), the glitter also shows a subtle hint of other colors. I was impressed with Snow because it applied nicely and was opaque in 2 coats--not my typical experience with a white creme! Frosty softens the look of Snow a bit, while also dressing it up with its sparkle. The formula of Snow reminds me of the Color Club Japanese glitters and some of the China Glaze glitters, in that it's a little jelly-ish. I'd like to try Frosty over a darker color to see what that looks like also. Has anyone tried that? What did you think? The entry period will be open until midnight tomorrow, 10/23/10, and I'll announce the winner on Monday. I hope everyone has a great weekend! i need a godo white creme, i have 4 disgusting ones lol. The snow looks like fresh snow when the sun hits on it!Love the whites! very pretty colors, especially Frosty! this whole collection is great! I adore Frosty! So pretty. I love Frosty, and Snow sounds like a really nice white creme. It is hard to find a nice one of those! I need these!!! After all, I live in perpetual snow and frost. Heheheheheee. Lovely colors. Snow is my favorite out of the whole collection. I want it so bad! I'd been eyeballing Frosty, but wasn't sure how it would behave in real life. Sounds like it can work on its own, but also looks lovely over other colors!! I would love to try Snow.. I really like it. Frosty looks nice. Almost like it's sugar-coated. this is the first time i have ever lemmed white polishes! prettyyyy...lol now i have winter wonderland stuck in my head because of these colors. They match wonderfully! A perfect winter mani :). Enter me please - blanche.bATgmailDOTcom. I'd love to be entered, please. Thanks! I'm surprised by how much I like these. 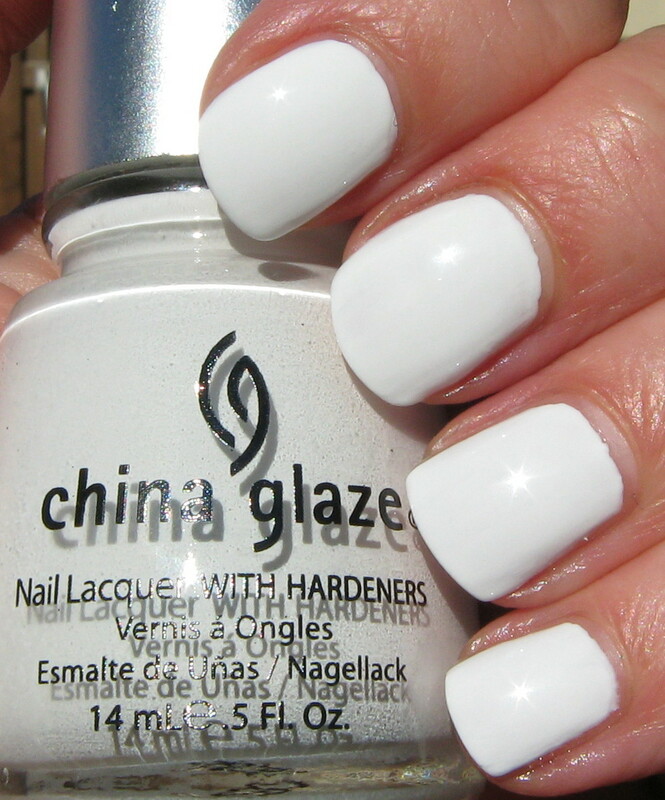 Always looking for a great white polish! Gorgeous polishes! I have a Gosh polish named Vanilla Ice that is a sheer white glitter... It looks STUNNING over black, would love to try this one out over black too (you can see Vanilla Ice on my blog)! Sadly it didn't make my top 3 which I decided to get, so I'd be thrilled to enter your giveaway! Frosty looks really pretty over snow! :) I would very much like to enter, please. 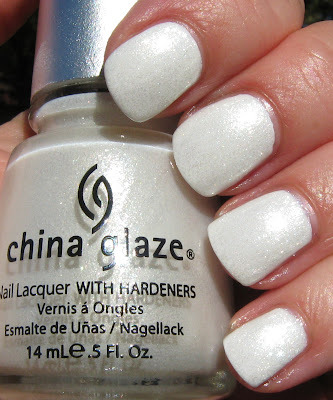 these polishes look nice..i'd like to own a white polish that isnt streaky. *grabby hands* want want WANT!!! I got all of the rest, and missed these because they weren't out on the TD site. I don't normally like white nail polish, but both of these whites have grown on me due to the copious number of swatches I've seen. 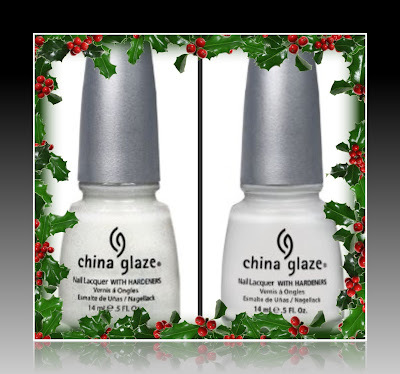 That much be good for China Glaze's business, right? I've never tried a white polish, but these look really pretty! I really like both colors and they look good together. I knew I wanted Frosty, but Snow looks really good too. Can never have too many good white polishes. i need some white polishes in my collection!! I'd love to win either of these! Please enter me in your giveaway. I Follow you on Google Friend Connect. I've never thought about wearing white in the colder months. I really like the look of Snow. Thanks Mary. With the time difference, I can't tell if I'm too late. Sorry if I am! I like this creamy white, it doesnt look cold. Enter me please, my address is jennys1983@hotmail.com. Thanks!